This is a Free event. Space is limited; order tickets on Eventbrite. 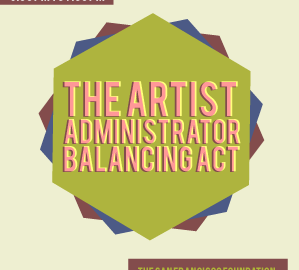 Arts administrators simultaneously working as artists balance the demands of multiple professions, a common challenge in the field. While different artistic disciplines require unique time and space for practice, creation and performance, the “work-work-life balance” of artist/administrators is a creative pursuit in itself. In wearing multiple hats, How do artist/administrators navigate potential conflicts of interest? Also, How does the level of commercial demand for one’s art impact the sustainability of the practice? 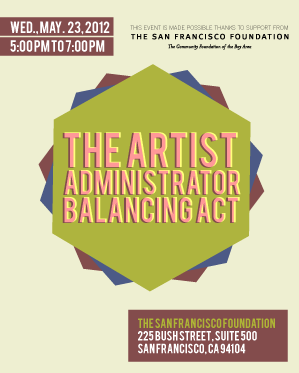 During the discussion, panelists and audience participants will consider how arts workers can feasibly balance two careers, as well as the ways in which one’s artistic practice informs administrative output and vice versa. I failed to pick up one of the handouts at last night's discussion/workshop, and, among other things, want to see the entire animal-print spandex video. 😉 Could you perhaps hyperlink the panelists' names so we can follow up from here? Thanks! Hi, Montana. The panelists names have been updated with hyperlinks. Thanks for coming! Cheers, Michael DeLong, managing editor.